What does a chef look like outside of the restaurant? Where does he wander? Bob Cut sat down with local food maven Chef Jason Fox to get the story. Founder of Commonwealth, the oft-praised foodie destination in the Mission District, Chef Fox has spent years modeling his business to represent an artful, culinary experience possessing of a moral compass pointing due North. Commonwealth strives to be as sustainable as possible through their food sourcing, as well as fiscally generous by donating a portion of their revenue to local Bay Area non-profits each month. 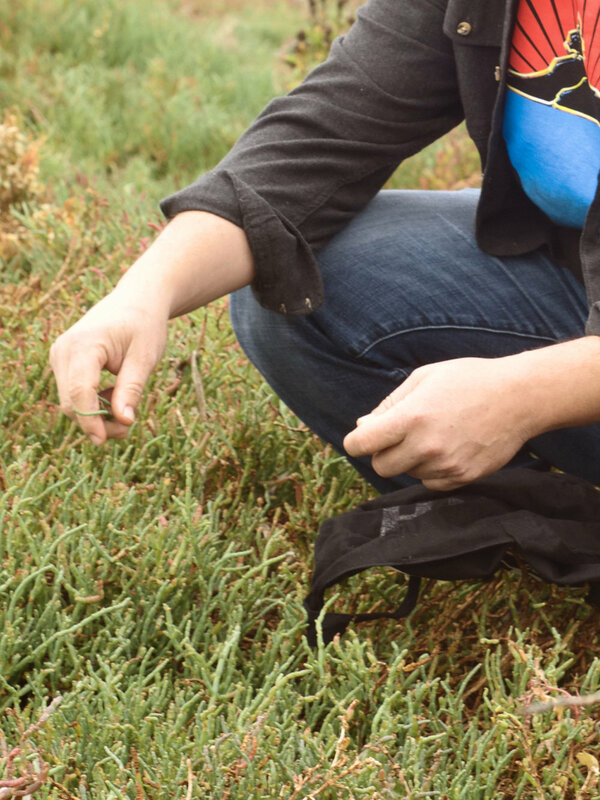 As far as his personal activities go, Chef Fox also maintains a close connection with San Francisco flora by way of his outdoors excursions with his daughters through the headlands of Marin. In regards to your "secret spots" around Marin, how does the landscape and natural abundance of the Bay Area influence your craft? How long has it taken to find these locations? Do you have any interesting stories or anecdotes about the time spent foraging in these areas? Chef Fox: We use the local landscape to create a sense of place, and terroir, and hopefully to filter into all into our own personal vision of cuisine. Wildflowers and herbs at different times of the year, as well sea plants, mushrooms, coniferous trees, and others. I have been living here for a while, so I pretty much have different spots around the bay where I know certain things are going to be growing at certain times of the year. Each year it is interesting to go back to similar spots and see which are more fruitful, and how they have been affected by the weather of that year, or even the previous year. You take your daughters along with you on these excursions; did you partake in similar activities as a child? Was food and nature something you always gravitated to? What do you hope to instill in your children through these adventures? Chef Fox: When I was younger, I did not forage with my parents, but we spent a good amount of time in the outdoors. Working long chef hours, it is nice to be able to spend time with my daughters, and introduce them to the natural world. I guess I hope to instill a love and respect for nature, and the cycle of all things. How did you establish yourself in the food and restaurant industry? What was the most difficult starting challenge you faced at the beginning of your career? Chef Fox: I established myself by working quite a bit. It did not happen overnight. I used every place I worked at as a building block to the next, trying to learn as much as I could. Sometimes you learn the right way to do things, and sometimes the wrong, which can also be a lesson. By the time I was the chef of my first restaurant in San Francisco, Bar Tartine, I had over ten years of working at various types of restaurants under my belt. At the beginning, it was all about putting in hard work, putting my head down and learning. I was quiet, eager, and had no attitude, so I was able to absorb a lot. The biggest challenge was how much there was to learn, which is one of the reasons I still love what I do. What about the Bay Area inspires you to constantly create new dishes and keep Commonwealth relevant in the SF restaurant space? Chef Fox: I am constantly inspired by all of the great products we get here. From the farms, to foraged things, to everything that comes from the ocean. I especially love the seasons of the ocean, crab season, spot prawn season, squid season, etcetera, to be challenged to look at different ways of using all of these ingredients. I am also inspired by all of the other great chefs here, that I have been lucky to cook with, and eat at their restaurants. Chef Fox foraging responsibly for future menus. Tell us about your process of developing menus and selecting wine, and overall establishing the feel and character of Commonwealth? Where does that inspiration come from? Chef Fox: Menu creation always starts with the seasons. The kitchen team and I lay out a rough outline of everything coming into season, or maybe just products we want to work with, and start sketching up ideas. Every year we like to look back at what we do, and try to see what we can create differently. How many different ways can we treat a pumpkin, a persimmon, etc. We have a sort of ethos to how the dishes work independently: seasonal, creative in flavor, importance of balance of flavor in ingredients and techniques (salty, sweet, acidic, umami), and texture (creamy, fibrous, crispy), interesting combinations and techniques, and the number one most important factor, deliciousness. Once we have tested the dishes, and feel ready to put them on the menu, we meet with the GM and beverage director and just start tasting with wines and beers to see what works. It's usually done by committee, but we are always looking for an interesting pairing. Where did the name "Commonwealth" come from? Chef Fox: Commonwealth has a double meaning to us. It stems from our early attempts to dissect fine dining, and take the things we liked about haute cuisine food and service, and implement them into a more accessible restaurant. It felt like at some point, years earlier, you had to go to the high temples of cuisine to experience interesting and creative food. This was 9 years ago, when we opened, but now I think many people are doing interesting things at lower price points. It also refers to our charitable and philanthropic goals of the restaurant, in which we always intended to give back to the community in different ways. // Photography by Isabella Welch.